The album also received largely favorable critiques, earning a number of trophies at the 1989 Grammy Awards and several features in the Rolling Stone, including #10 on their Top 100 Best Albums of the Eighties. As both a popular and politically-involved artist, Chapman was invited to take the world’s stage at events such as Nelson Mandela’s 70thBirthday Tribute. While she was careful to distinguish herself as an artist from the role and power of policy-makers, as a participant and producer of popular culture, Chapman was also well aware of the influence she could have, and took a political stance for the marginalized communities she would be an ally to. According to Steve Perry for The Orlando Sentinel, Chapman’s critical acclaim was largely due to the political messages in her songs, in particular when tackling social injustices. She always demonstrated an “empathy for the underclass” in her music (Duffy 1988). Perry, who was also a contributing editor for Rock’n’Roll Confidential,notes that Chapman’s critical and popular success may have reflected “a growing awareness of the polarization between wealth and poverty in the nation” (Duffy 1988). Under the Republican government, this “era” in America’s political history was seen as a “revolution”—an ideological and structural shift to the right to enforce nationalistic values and ambition in the tough sociopolitical climate of the Cold War. Reagan pushed for less government involvement in public affairs; he lowered tax rates and brought down the expenditure on domestic needs and other social welfare programs. He filled his cabinet with business-oriented conservatives and promoted the success of executive branches who could invest, earn, and lead large numbers of workers to fulfill entrepreneurial goals (Troy 2009, 53). [T]here are millions of young Americans in their 20s who barely remember, barely remember the days of gas lines and unemployment lines. And now they’re marrying and starting careers. And to those young people I say, “You have the opportunity you deserve, and I’m not going to let them take it away from you” (Bush 1988a). A large crowd cheered enthusiastically when Bush delivered this speech, as testified by the video archived on The American Presidency Project. At the time, the popular music charts seemed to generally reflect the celebration of Bush’s succession from Reagan. The charts featured primarily an upbeat, male-dominated list of easy-listens that combined well with the renewed sense of hope in the American dream as the Cold War was coming to an end—songs such as “Monkey” by George Michael and Elton John’s “I Don’t Wanna Go On With You Like That” (Billboard). Yet in the midst of these, only one week after Bush’s enthusiastic nomination speech, Chapman’s most popular single “Fast Car” peaked at #6 on the charts. Not only was the acoustic and minimalist sound of Chapman’s single striking in comparison with such rock classics, but the topic of the lyrics also stood out in their description of cycles of hopelessness, abandonment, loneliness, and inequality for those who were on the other side of the poverty line. Instead of keeping with the romantic, party-favourite themes of the other singles on the chart, Chapman sings, “Starting from zero, we got nothing to lose” —a stark contrast to Bush’s statement that young people can’t remember days of struggle and are currently reaping all the benefits. In this sense, “Fast Car” boldly expresses social injustices that were being ignored in the speeches that made it to the headlines and that reached the big crowds. 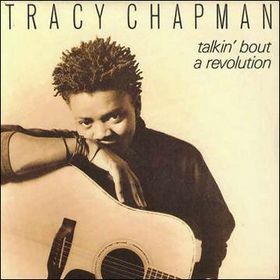 In the 1988 article in The Orlando Sentinel by Thom Duffy, Chapman reminded readers that “Talkin’ ’Bout a Revolution” was not meant to be idealistic, despite its sweeping lyrics and its insistence on words like “rise up,” “revolution,” and phrases like “take what’s theirs.” These words evoke strong images of change, action, and solidarity among marginalized peoples, and seem to portray change at a much faster pace than Chapman thought could be possible. Acknowledging that there is poetic freedom in songwriting, Chapman maintains that the message can still be heard: “I think people are foolish to believe there won’t be major social changes in this country […] There’s only so far you can push people before they start to push back, and I’ve seen that.” Her voice on these political matters and the way she explains her instrumentally simple but thematically impactful songs shows that music can be an active force in sparking social change and justice. There’s no linear, direct line from a song to political change. But there’s a role to be played, for sure... Music, obviously, has always been a part of every social and political activist movement. That’s simply because it’s evocative of emotion, and that’s powerful... It can uplift the spirit, enliven the mind, and bring solace and, hopefully, joy as well (Wernick 2015). Chapman continues to be a household name and an influential member of the global community, representing marginalized spaces and peoples in her popular songs and in her activism. As she gained recognition first through her powerful single “Fast Car,” Chapman’s debut album picked up momentum in sales and, as a whole, showed her political relevance in American society. As we can see from radio interviews as recent as four years ago, messages from the 1988 album continue to be relevant to the political agendas of numerous social justice groups and movements. Popular culture is important in activism as it can help to raise voices among a society that doesn’t properly acknowledge them and the justices they are owed. During a political era marked by strong Republican faith in America, news media covered stories of political leaders showcasing the American dream, which contributed to their popularity among voters. The music charts also appeared to endorse the celebration of what it is to be American after the uncertainty in the Cold War. However, an outlier to this phenomenon was Chapman, whose history as a protest singer was reflected in the themes she wanted to sing about when she was offered a recording opportunity. Her participation in social and political causes was an opportunity to help those in need—but, as Chapman acknowledges, “it will not change the way the world works” (Wernick 2015). Action does not stop here, nor does it even begin there. Yet by bringing light to important social justice movements via popular culture, an artist can amplify the actions and rally the voices of policy-makers and politicians working together for social change. ROLLING STONE. 1989. “100 Best Albums of the Eighties.” Rolling Stone, 16 November. BILLBOARD. 1988. “The Hot 100: The Week of August 27, 1988.” Billboard News, 27 August. BUSH, George H.W. 1988a. “Acceptance Speech | President George H.W. Bush | 1988 Republican National Convention.” Youtube, uploaded by Republican National Convention, 7 March 2016. BUSH, George H.W. 1988b. “Address Accepting the Presidential Nomination at the Republican National Convention in New Orleans.” The American Presidency Project, 18 August. DUFFY, Thom. 1988. “Poverty and Despair Crack the Top 10: Tracy Chapman Puts Social Issues to Music.” Orlando Sentinel, 6 September. MARGOLIN, Emma. 1988. “‘Make America Great Again’-Who Said It First?” Orlando Sentinel, 6 September. CBC. 2015. “Tracy Chapman’s greatest hits celebrate quietly powerful legacy.” CBC Radio, 18 November. TROY, Gil. 2009. The Reagan Revolution: A Very Short Introduction. Oxford: Oxford University Press. WERNICK, Adam. 2015. “Tracy Chapman’s new greatest album celebrates a quietly powerful legacy.” Public Radio International, 20 November.